This is not a travel log where the events of every day are detailed. Instead, I have presented some of the highlights, lowlights, unusual, humorous and embarrassing events of the trip along with relevant photos and some opinions. Others may have seen things differently but this is the way I saw things. Anything I say about anyone or anything is purely in fun. Some information and photos I obtained from others on the trip. I may have enhanced some of the information I gathered. Anything that is blatantly incorrect please let me know. All photos used have been converted to a smaller size for faster downloading. There are lots of single and multiple photos to view. Wherever you see any coloured text that is underlined such as "this photo" or "these photos" and you select it, another window will open with a photo or the first photo in a set of photos. If there is more than one photo, you will see "prev" and "next" at the top left and right respectively. Select one of these to scroll back or forward through the photos. Alternatively, you can select "thumbnails" at the bottom of the window to see thumbnails of all the photos and then select a thumbnail to see the full photo. When you have finished looking at the photo(s), close the window containing the photo(s). The trip was organised through World Expeditions by Dennis, the "President" of the Warby Ghost Riders cycling group. We started in Bhutan after an overnight stay in Bangkok (Thailand). Eleven days in Bhutan and then back to Thailand for four days. Both destinations involved cycling and visiting tourist spots. Support vehicles followed us on all bicycle rides. Both trips were locally run by Grasshopper Adventures and were slightly modified versions of one their standard tours. Tandin Dorji was our primary guide in Bhutan. Highly intelligent and articulate he became part of our families. Passionate about Bhutan and its culture, flora and fauna, he had an answer for every question we asked. We even got to meet his 8 month old daughter at the end of the trip. See this photo. Numga was our other guide who was just as enthusiastic as Tandin. See this photo. Damri "Seen" Suwamin was our guide in Thailand. Extremely enthusiastic and articulate, he excelled in looking after us. See this photo. The drivers of the vehicles attached to each team in both Bhutan and Thailand were also excellent. I could not fault their support. 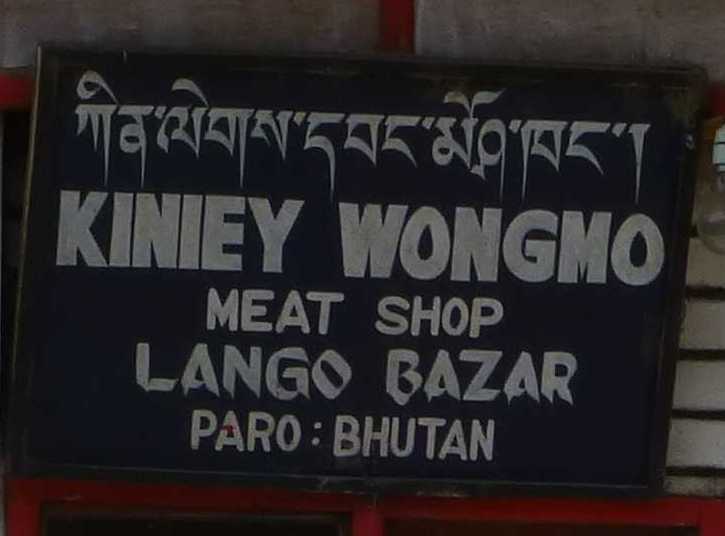 In Bhutan, I think their names were Kinzung and Pema. Smoke. As of May 2013, it is the only country in the world that completely bans the sale and production of tobacco and tobacco products. Under the law, any individual found selling tobacco can face imprisonment for a period of three to five years. I did see one older person smoking in the countryside. Traffic lights. There was a set in Thimphu, the capital, but they were removed. There is lots of traffic in Thimphu but it is controlled by police. See this photo. Cars. When we were visiting there was a ban on the importation of cars. Apparently, this happens from time to time to limit the number of cars in the country. Fishing. It is banned because the Buddhist culture does not kill anything. I asked if they allow one to catch fish and then let them go but did not receive a definite answer. Beggars. I was not accosted by any in Bhutan or Thailand. In Bhutan, I did see a few people sitting beside prayer wheels with a donation tray but they did not actively accost me. Ironically, the first beggar I was accosted by was at Southern Cross station when I returned to Melbourne. Cappuccino machines. Despite looking everywhere we could not find one. There was espresso and filtered coffee and it was usually very strong. Tea was usually very weak. Ice creams. Very few places sell them. People hassling you to buy something. This is different to all other Asian countries. Tourists. I saw very few. They were clustered in some places (like the Tigers Nest monastery) but nothing like in other Asian countries. Push-bikes. Only saw a few. Tuk-tuk's. Did not see one. Taxis are plentiful and very cheap. Norm took a taxi to the Budd in Thimphu and only cost the equivalent of AU$5 for 1 hour including 30 mins waiting time. Ski Resorts. There are none in Bhutan but there is lots of snow. Free-ways. Except for a few valleys, I don't think there is anywhere in Bhutan where the land is flat enough for any long dual lane free-ways. I did see a concrete overpass in Thimphu. Public Swimming Pools. I was told there is a heated one in Thimphu but did not see it. McDonald’s, KFC, Pizzas or any of these Western take-away places. Chocolate. Difficult to get in some places. Doughnuts. I looked in a few bakeries but could not find any iced doughnuts like what we have in Australia. At Bangkok airport on our way home I purchased a doughnut but it was terrible. Butchers. Well, I did not expect to see any but I did find a "meat shop" in a village. See this photo and this photo of the sign expanded. Casino. There is a small amount of legalised gambling allowed but only due to the influence of nearby India. In general, gambling is actively discouraged. All signs are in English and it is taught in all schools as the second language. Helicopters. There are plans to purchase some. The King has been known to ride a bicycle so we did put out an invitation for him to ride with the Ghostriders but we got no response. The downhill rides in Bhutan. They were exhilarating and the views spectacular. The best was 52Km, a drop of 2,000m in about 2.5 hours. We even passed cars and trucks on the way down. We did slip and slide a bit around corners and over gravel and hit numerous potholes but nobody had an accident. In the case of the riders in the front, we were going as fast as we could. Simon "ululated"*** every time he passed a vehicle or people and some even ululated back. I could not ululate but Ray and Tandin could. Visit to the "Tigers Nest" in Bhutan. A monastery built on rock face. Long difficult walk to get there but well worth it. Gonny and Peggy took a horse ride part the way, walked the rest and walked back down. They had a fire in the monastery in 1998 and it was restored. I could not see any signs of a fire and the "new" beams looked very old. However, I was told that old beams were sourced for the restoration. *** Ululating is a loud, long, wavering, high-pitched vocal sound resembling a howl with a trilling quality. It is produced by emitting a high pitched loud voice accompanied with a rapid movement of the tongue and the uvula. Simon was very good at it. See youtube for examples. On our very first night, we had to stay overnight in a hotel in Bangkok called the Convenient Grand Hotel. They did provide transfers to and from the hotel but I would not recommend the hotel. It was a long way from the airport and the city centre. They provided us a breakfast in the morning but it was terrible. My perception of the hotel may be tainted because we arrived there about 9.30 PM and left there at 4.00 AM to catch the plane to Paro. Heat and humidity in Thailand. Always. In Bhutan, I did not see any "dodgy" people. We all took a large number of photographs. I took 1,200. I could not fault any of the organised food on both trips. Even though the Bhutanese food was primarily vegetarian it was delicious. I was told that the few meat dishes offered used meat imported from India and that it may be "dodgy". Whether this is true I could not confirm but I avoided the meat dishes. Others ate the meat dishes and did not get ill. The desserts in Bhutan were a little light and quite often there was watermelon. Bhutanese love their chillies but most dishes had labels and the staff also warned us about the hot dishes. The best food was our first night at the Boutique Raft Resort in Thailand. We all started off by ordering our own selections. Seen, our guide, then ordered a huge selection of other foods. In the end we had more than enough and it was delicious. The food at the Khin Lom Chom Sa Phan restaurant in Thailand was excellent. Focusing on seafood they had a vast selection and the service was fast and the food good quality. An open deck beside the river with a view of an unusual bridge across the river. In Bhutan the weather never stopped us doing anything. It never rained whilst we were riding. In Thailand it was hot and humid every day. The consequences of this is are detailed elsewhere. See these photos of individuals, these photos of two or more and these photos of everyone. I lost my wallet in Thailand. I panicked and cancelled my credit cards only to remember where I may have left the wallet. The next day Dennis located it where I thought I had left it. Thanks to everyone for their concern. At the end of the trip, I left my helmet and attached rear view mirror with the guide in Thailand. Norm left his two drink bottles in Bhutan as a donation. In Thimphu we visited the largest Buddha in the world. On the way back we stopped at a scenic point for photos. Someone noticed that Ray was missing. We had forgotten him!. Drove back up and found him walking back. He took it very well. Dennis had a camera mounted on the handlebar of his bike and the mounting broke on one of our downhill rides in Bhutan. The camera hit the ground but was not damaged. Royce (72)/Simon (54). The average age was 66. In Thailand, the riding was very difficult. Extreme heat and humidity forced us to stop continually for drinks. I did not urinate until well into the afternoon on some days. They say this means you have not drank enough but I did drink as much as I possibly could. The first day riding was the worst. I did not notice, but Dennis dropped behind a few kilometres before we finished for that day. When he finally rode in he was completely spent. I have never seen him that bad. I would not recommend riding in Thailand in such conditions. In both Bhutan and Thailand petrol price was comparable with Australia. However, LPG in Bhutan was around $10.00/litre. In Thailand we stopped riding briefly to visit a cave. I noticed a group of youths pointing and laughing at me. I asked the guide what they were saying and he said that they were saying I was lady-boy. I believe this came about because of my lycra cycling pants. Ann (my wife) made me some new ones and they were multicoloured. In Thimphu, we rode from the hotel to the base of a mountain and then walked up a zigzag track to the Cheri monastery. About 16km ride. It was not an easy cycle and some took the minibus along the way. After visiting the monastery and having lunch, Tandin, Ray and myself were the only ones that wanted to ride back. Tandin and Ray got away from me on the downhills but I caught them on a long uphill only to fall back when we hit a headwind near the hotel. The minibus was following us and unknown to us the others in the minibus were treating it as the Tour De Bhutan with appropriate commentary. On at least 5 buildings I saw phallic symbols painted beside the entrance door. Many shops had wooden penises for sale. I asked one shopkeeper what they were for and he replied that they ward against bad luck or something like that. See these photos. Such things would be banned in Australia and I found them unnecessary and offensive.. It was so cheap to get done by the hotels we stayed at that most of us used it at times. The maximum I paid was $8 AU for a large bag. It usually came back neatly folded with some of the buttons done up. On a mountainside out of Thimphu they are building the largest Buddha in the world at 51.5m. We visited it one afternoon. Still not complete but it was very impressive. See these photos. This visit was not on the itinerary but the guides were happy to take us there after we asked them. The hotel Dewachen where we stayed in the Phobjikha Valley in Bhutan for 2 nights. Set high on the side of the valley with a magnificent view it was a beautiful and magical place. The Phobjikha valley is home to the rare black necked cranes from Tibet who spend the winter there. Massive rooms with valley views. Even the shower had a view of the valley through a small window. In terms of atmosphere it was probably one of the best places I have ever stayed in. No TV or internet and the power went off on the first night after a huge rain downpour. Power had not come on before we left but it didn't matter. They had a generator (they turned it off at 9 pm) and they cooked some things on the wood fire in the dining room. We had wood heaters in our rooms which most of us lit. It was booked out by us and a group of Americans. A room with twin beds costs approx $60 AU per night including sales tax and service charge. See this photo. The Boutique Raft Resort in Thailand where we stayed for 2 nights. Hotel units set on rafts on the River Kwai each with a private view to the river. See this photo (from their brochure). Simon and myself had digestive problems. Simon recovered in a day or so. I had loose bowels for a few days but it never stopped me doing anything. A few others mentioned that they had upset stomachs but nothing major. There were no injuries. This is surprising considering some of the downhill rides we did and the speed involved. I lost 3kg and Dennis lost 5kg. Suspect most of this from riding in Thailand. In Thailand, we visited various places associated with the Thailand-Burma railway. We walked the bridge over the river Kwai, visited the Chungkai War Cemetery, visited the Hellfire Pass museum and walked to the Hellfire pass and lastly had a ride on the death railway train. At the end of train journey we walked back over a dodgy trestle bridge and visited the Krasae cave once used as a hospital. Many of us have a family connection with the events associated with the Thailand-Burma railway and I found it very emotional. Saw some seats with no backs or bottoms at the archery field in Paro (Bhutan). Very uncomfortable to sit on. See this photo. The hotel in Thimphu had a phone beside the toilet. See this photo. Also had the biggest shower rose ever. See this photo. In Thimphu I noticed they have 24 Seven and 8 Eleven shops. See this photo and this photo. Television was only recently introduced to Bhutan. At Bangkok airport, whilst waiting to check in for our flight to Paro, there were lots of passengers with flat screen televisions taking them back to Bhutan. Is parking bikes the same as parking cars? See this photo. The sign says "NO PARKING IN FRONT OF DUTY ROOM" but they do not ask us to move on. Many prayer wheels in valleys where there was a water source were powered by the water and thus were in continuous operation. In the Phobjikha valley in Bhutan, Norm and myself went for a walk one afternoon and on the way back were hailed by Tandin and Numga (our guides). They were in a house/shop having drinks with some friends. We joined them in the house and stayed for an hour or so having a good "Harry" chat. Saw their friends a few days later in the Dochula restaurant near the Dochula pass where we erected the prayer flags. On the same walk as above, we were aware of a young girl (about 15) walking behind us. She asked us where we were from and we ended up having a long discussion with her which I found very interesting. She spoke good English. She was wearing glasses and I wondered how far she had to go for the optical care given that the valley is very remote. Many of us tasted the local "Druk" beer. It was very good but had an 8% alcoholic content. See this photo of the best house I found (in Thailand). This photo of an unusual maker and product in a can in Thailand. The spider and the frog. Took this photo at the Chimi Lhakhang temple. Expected the frog to eat the spider but it didn't. The "Divine Madman" built the temple. It is famous for infertile women to visit to pray for children. See these photos of interesting signs. The curious looks we got from some locals as we rode past, in file, in our bright Ghostriders jerseys was amusing. One evening in the dining room at the hotel in Paro we were joined by a group of people all dressed in white jumpsuits. They were on a "retreat" and did not talk. It was a bit strange. After we visited the Cheri monastery out of Thimphu we had lunch and then played a game of throwing these large darts at a target. See this photo of a mailbox in a remote area in Bhutan. The box was mounted high near the roof line and you would have needed a chair to reach it. See this photo of a staircase carved out of one piece of wood. We saw lots of these. Lastly, what do you make of this photo. It looks a bit ghostly to me. In the Phobjikha Valley in Bhutan they are passionate about the habitat of the Black Necked crane. The valley is a migration destination for the crane which are a threatened species. They have put the electricity underground where the crane nests. We visited an information centre and watched a video about the crane. See this photo. 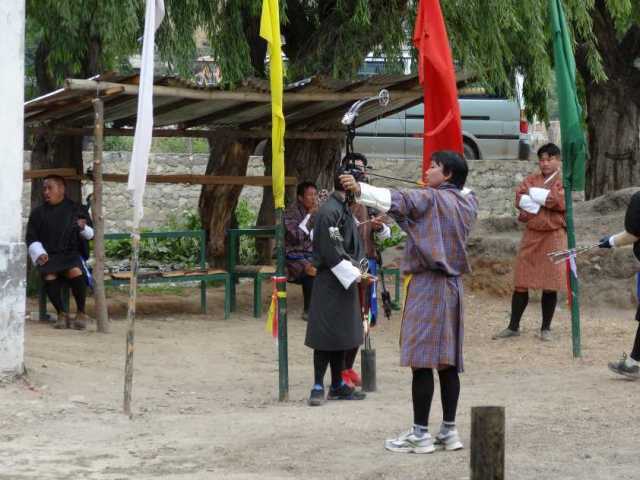 We visited an archery competition in Paro (Bhutan). See this photo. The bows that they were using are very expensive but the safety of the participants at the target end was a worry. It was about 140m to the target and they were standing very close to the target whilst arrows were being shot. This is the only Olympic sport that Bhutan has ever won a medal in. See this photo. When an arrow shoot is successful, the participants do this weird dance. Found out later that they imitate the mating dance of the Black Necked crane. Apart from some breathlessness, nobody had a problem. The Phobjikha valley sits at 3,000m and we spent two days there. Most of the time we were between 1,500 and 2,500m. 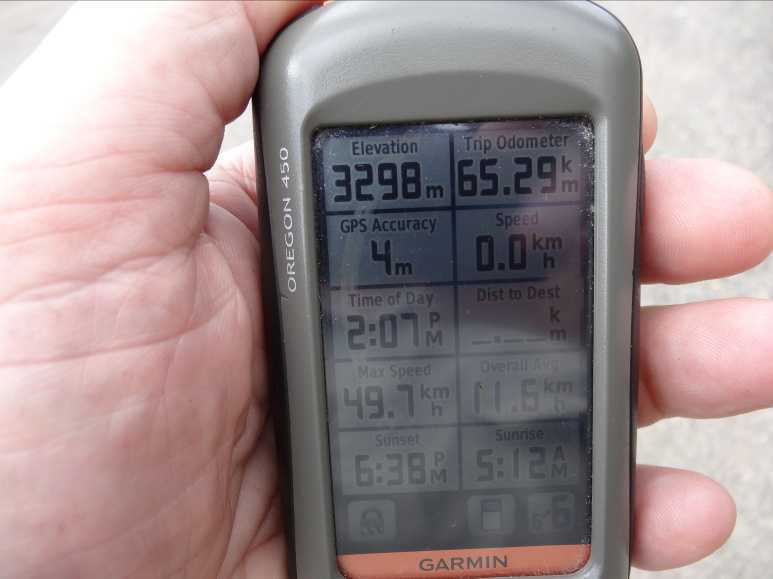 The Lawala Pass marked the highest point of our trip at 3,298m as recorded by Dennis' trusty Garmin. See this photo. On our ride to the Chen monastery out of Thimphu, we were stopped at one point because the Bhutanese Royal Body Guards were practising shooting. I did hear the noise in the distance as we were approaching but I thought it was blasting. They eventually let us pass after we loaded our bikes on our truck and we all piled into our minibus. See these photos. At Paro International airport. The short runway is in a deep valley surrounded by very high mountains. To land and take off, the pilot has to manoeuvre the plane through valleys between the mountains and execute sharp turns. I was lucky to have a window seat behind the wing and could see the wing-tip nearly touch the grass as the plane wound its way to the runway. There are videos on youtube that show the landing but one is taken from the cockpit and does not show the wing-tip nearly touching the ground. There are only a few pilots that are certified to land planes at Paro. 241 meters long and 200m above the Pho River. And we rode over it on our bikes. I found it scary. Just focus on riding and don't look down. See this photo. We passed over it on our ride to visit the Punakha monastery. The track to get there was dirt and very muddy due to heavy rain the night before. We also rode across a bridge in Thailand but it was not really a suspension bridge and not as scary. See this photo. Dogs have a free rein in Bhutan and don't seem to be owned by anyone. During the day they sleep and at night roam the streets and bark incessantly. Did not see that many cats. Did not see many chickens running around. Was told they keep them locked up because of roaming dogs. On our walk to the Cheri monastery out of Thimphu, We encountered a group of people with huge lenses on their cameras. Nearly needed a porter to carry them. In Bhutan on our last day we were privileged to be entertained by the Tshangyang Wangpoi Duedtse. Male and female dancing and singing accompanied by instrumental backing. It was very good and lasted about an hour. We were fed tea and pastries during the performance and I purchased their DVD. Afterwards we were offered Australian wine and each given a gift of a scroll. The head of Bhutan team who we had not yet met intended to meet us but was ill. It was a fantastic and emotional end to our Bhutan adventure. See these photos. When we first arrived in Bhutan and got settled in the minibus, we were all presented with a white scarf. A lovely start to our adventure. Some of us wore the scarf’s later on. In the town of Punakha in Bhutan some of us decided after dinner to visit a bar in the town. Our guide took us to a bar he knew. We had the privilege to be entertained by a talented local singer playing his guitar. See these photos. Myself and Norm. In Bangkok on the last day, we spent over an hour lazing in the pool on the roof of the hotel. John waded into the river after we crossed the suspension bridge in Thailand. The biggest export industry for Bhutan. All their electricity is generated by hydro. They sell it to India and they plan to build more stations. Bhutanese are charged 2c/KWh for electricity (Australia is about 30c), probably the cheapest in the world. In the Paro main streets and some parts of Thimphu the electricity lines are underground. Watched the lowering of the flag at the monastery near the King's palace in Thimphu. Lots of marching by the guards. Afterwards we visited the monastery. Norm and I walked to the Stupa in Thimphu one night after dinner. Another evening we walked around the block and through some of the dimly lit areas in Thimphu. Did a nature walk in the Phobjikha valley. About a 3 hour walk from the hotel through the nesting grounds of the Black Necked crane, a forest, a village and a steep ascent to the Gangtey monastery. Tandin gave us all prayer flags to erect at the Dochula pass (3,200m). At the time it was very misty and cold and there were thousands of other flags already there. See these photos. A few days later we passed through the same pass and the weather was clear. Visited the National Museum of Bhutan in Paro. I found it interesting. Visited a farm house in Paro. Had a drink of something there which I did not like. See this photo. Watched some monks chanting (and then we had to give a donation). Others visited a school in the Phobjikha valley in Bhutan. They said it was very interesting. Canal cruise in Bangkok. Some areas reminded me of the canals in Venice complete with sludge, rubbish and decrepit buildings. I wonder where the sewerage ends up. See these photos. Visited Wat Arun (The temple of Dawn) in Bangkok at the end of the canal cruise. Afterwards, we decided to walk back to our hotel which took a few hours. It was very hot but an interesting walk. Visited an elephant park on one of our rides. See these photos. Visited the Lawa cave on one of our rides. Visited the Muang Sing historical park at the end of our riding. Dennis and I walked to the "Grasshoppers Adventures" office in Bangkok one morning. This company was used by World Expeditions to conduct the cycling tour in Thailand. The owner, Jason, is an Australian and lives in Tecoma (in The Dandenongs). See this photo. We visited a few. Some were in difficult places to get too and not everyone made the journeys. They were all very similar inside. The best one was the Punakha monastery. Not because of the architecture but its location. Set between 2 rivers with a lovely garden surrounding the complex. The Gangtey monastery we visited in the Phobjikha valley had an internet room. See this photo. Unusual, because the hotel we stayed in in the same area did not have internet. Gonny, John and Norm. Gonny had knee issues. John had an ankle issue and Norm had trouble with breathlessness at higher altitudes. Gonny and John are no strangers to long and difficult rides as they have both ridden around Australia. In the restaurant in the hotel in Thimphu one evening there was a table full of French tourists. They ate all the dessert before all of us had eaten. This caused some consternation amongst us and there were a few words spoken. Luckily, they did not understand or speak much English. We encountered some American tourists in the Phobjikha valley at the hotel we were staying in. A group of older, well educated people. Others spoke extensively with some but I only chatted with one rather eccentric lady. Most of the dwellings in Bhutan we saw were of a reasonable standard. I did not see any "shanty towns" like I have seen in Cape Town or Peru. There was the occasional derelict building but no large groups of them. Thimphu is in a building boom. On our ride from Paro to Thimphu we rode through the centre of Thimphu and there are new buildings being erected everywhere. They use bamboo for scaffolding. See this photo. See these photos of some locals. I was not very happy with the driver who drove us to and from our cycling location in Thailand. It was about 3 hours drive each way and he completely ignored any speed limits and the minibus had no seatbelts. However, he was good ferrying us around whilst cycling. In Bangkok we flagged down a Tuk-tuk to take us to a night market in Bangkok. He was a crazy driver. We took a taxi back. In Paro, after we visited the Tigers Nest monastery a few of us wanted to check out the shops. Tandin suggested we have coffee first and he took us to "tshernyen's cafe". It was a modern building in a newer section of Paro. The poor girl who served us did not know what hit her. Eleven people wanting coffee and cake. Five minutes later help arrived. The coffee and cake was very good. She even put on some Kenny Rogers background music for us. See these photos. Something we did not have to worry about. In Bhutan, they had bottled water on hand all the time and the drivers were continually offering to fill up our drink bottles. In Thailand, it was even better. They had water, ice and electrolyte supplements. At some breaks they offered fruit and Seen even purchased drinks for us. Because it was so hot Dennis and Simon put ice inside towels they placed on their heads. Gonny soaked her jersey in water. Dennis also made sure everyone had ice down their backs. In Bhutan, most of the roads were in poor condition. Potholes, washouts and landslides can be expected around the next bend. The best road was between Paro and Thimphu. It is very difficult maintaining roads in Bhutan because it is so mountainous. Roads either follow valleys alongside rivers or wind up and down the sides of mountains via the occasional pass at some high altitude. However, there was a lot of roadwork occurring. Much of the roadwork is done by manual labour. In particular, women with children on their backs breaking rocks with hammers. Saw some women cleaning gutters by filling up a cloth with silt, carting it across the road and dumping it. See these photos. In Thailand, the roads were very good. See this photo of a shop front in Paro. The size of the shop was about the size of the woman sitting at the front.. In Bhutan we had Trek 4300 mountain bikes with front suspension and they performed perfectly. The punishment inflicted on the bikes on the downhills was extraordinary. Some of the potholes we hit were massive but the bikes sailed over them. Our frame sizes had been forwarded before the trip and the bikes were matched to our sizes ready for us. Simon was very lucky. He is very tall and they did not have a bike to suit him so they purchased the latest model Trek bike for him. Bikes were mechanically checked before every ride. In Thailand, the mountain bikes were also pre-selected to suit our sizes. Each bike had a handlebar bag and a label attached with our name and travel insurance policy details (which I thought was a bit strange). The only problem we had with the bikes was 2 punctures and these were both on Simon's bikes. The rear brake on the bikes was operated by the RH lever. This is different to Australia and we were alerted and made aware of the difference. In Paro we rode from the hotel and back to the ruins of the Drukyel monastery at the top of a valley. About 34km. From Paro to Thimphu along the best road in Bhutan. About 60km. From Thimphu to the base of the Cheri monastery and back. About 32km. From Punakha to the Punakha monastery and back. About 16km. From the Lawala Pass to the town of Gangtey in the Phobjikha Valley. About 10km. From the Lawala Pass to the town of Wangduephradong. About 50km. From Kanchanaburi near the bridge over the River Kwai to the Boutique Rafts Resort. About 35km. From the Boutique Rafts Resort to a suspension bridge. About 40km. This day involved extensive riding through farming and bush areas and was interesting. From the Boutique Rafts Resort to the Maung Sing park. About 60km. In both Bhutan and Thailand mobile phone reception was good in all towns. In Bhutan, they had good (and free) WiFi in all hotels except in the Dewachen hotel where we stayed in the Phobjikha Valley. Bhutan has only embraced mobile and WiFi in the last decade and I was impressed with the coverage. On our last evening in the Dewachen hotel in the Phobjikha Valley we played UNO for a while. We all had a good laugh when John got caught with a handful of cards. So many that he could not handle them. See this photo. It happened in Punakha. Dennis asked the guides if they could get a cake and some candles. The cake had to be shipped in from another town. Not sure why, because on a walk around town I did see a bakery and went inside and they did have cakes there. See this photo. In Thailand, we stopped for a break from riding at a small shop in the country. Our guide pointed out a "Coke" stand full of drink bottles but the bottles were full of petrol. There were no fuel stations nearby and this was the way fuel was sold. See this photo. In Bhutan they accepted US and AU dollars. I did not see any ATM's but then I was not looking for any. The Bhutanese government imposes a compulsory tax that all tourists must pay. It is in the order of $200 AU per day and was included in our tour cost. This tax goes towards funding things like the free education and free healthcare programs in Bhutan but makes tourism more expensive. Bhutan was generally litter free. However, some places were worse than others. In Punakha there were lots of signs around about litter and lots of litter. I was amused by one sign showing a bin but the bin was missing. See this photo. In both Bhutan and Thailand the bottled water used came in biodegradable plastic containers. I did not see any bins specifically for recycling. In Punakha beside the Damchen Resort where we stayed for two nights we visited the local produce market that occurs every Friday. It was fascinating. Weird, cheap vegetables and fruit. Mangos 40c each. Scales with rocks as the balance weights. Faulty produce was thrown into a vacant area where the cows later consumed it. See these photos. Saw a lady spooning a white liquid from a huge container into small bottles which she sold. It was labelled eye ointment. Everyone had mobile phones. In the Dochula restaurant near the Dochula pass where we erected the prayer flags and rode through. In particular, Gonny and myself purchased magnificent hats that had been embroidered by local women working in a room near the restaurant. See this photo. In the main street of Thimphu we were taken to a shop run by the Government. Good quality but a bit expensive. Some of us purchased items. After our visit to the monastery out of Punakha we rode to the Nazhoen Pelri Skills Training Centre for disabled children and youths. See this photo of their sewing room. Good quality merchandise and we purchased some items. A weaving centre in the Phobjikha valley in Bhutan. Items made by local women. Norm and I purchased large cloths. The cloth I purchased was about 1m x 2m, brightly coloured with some gold threading. I met and talked with the lady who made it. She told me it took her one and a half years to make. At $350 US it was the most expensive item I have ever purchased overseas but well worth it. We are using it as a bedspread. The hotel Olathang in Paro where we stayed for three nights. A lovely hotel overlooking the Paro valley. Twin units set in the grounds. For two nights, Norm and myself had a unit with a balcony overlooking the valley. See this photo. Service was excellent. You could get a cup of tea anytime in the reception area. Large rooms and large dining area. The hotel Riverview in Thimphu where we stayed for two nights. Just a typical large hotel. Nice view of Thimphu, service was good, everything worked and it was not far from the city centre. See this photo. The Damchen Resort in Punakha beside the Punachu river where we stayed for two nights. Rooms very small and some of the reception staff lacked English skills but it was OK. The Nouvo City hotel in Bangkok where we stayed for two nights. An OK hotel. It did have a very good breakfast and a pool on the roof which Norm and myself used one afternoon. We used the attached restaurant a few times. Once we were the only ones there and we are sure the food was made elsewhere and brought in. Cheaper than Australia for most things. I should have taken my gel bike seat and my clip-on pedals. I did take my clip-on shoes with recessed cleats. To everyone on the trip for your fantastic company. Dennis for arranging the trip. All the guides and helpers along the trip. Bhutan is an interesting place. It is the only country in the world that supports a policy of “Gross National Happiness” and bans the sale and production of tobacco. The people are friendly and happy and it is one of the few Asian countries that appears to have minimal corruption. The current King has overseen tremendous development in all fields and I am impressed with him and the Government. My rating of this trip is 9/10.